Goetz could not have had the success in Munich after he settled there in 1904 without the group of loyal supporters and patrons, many of whom became his friends over the years. Leading the list must be his benefactors and good friends Guido von Volckamer auf Kirchensittenbach and his wife Antonie. 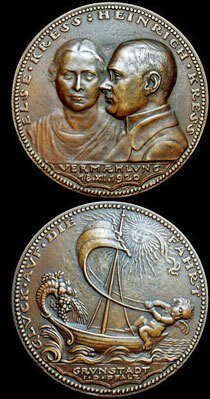 The group of medals from opus 114 to 125 inclusive is evidence of Mr. von Volckamers involvement with the art of medals and also of Goetz's skill with which he could satisfy his client. 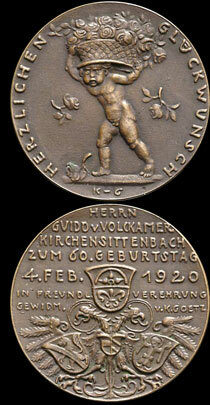 On the occasion of Guido von Volckamer's 60th birthday in 1920 Goetz made a medal congratulating his friend and wishing him the best for the future. This was a gift (opus 124). As loyal as his patrons and friends were to him, so Goetz was loyal in return. He did not forget the many kind deeds extended to him and his family. In the instance of court councillor Dr. Friedrich von Hessing in Göggingen, near Augsburg, Goetz designed and executed a medal to honor the eminent orthopaedist on his 70th birthday (opus 41). He dedicated this piece to von Hessing out of his deep gratitude for von Hessing's taking Goetz's mother and the youngest sister Josefine into his sanatorium after the father and two sisters had died during the diphtheria epidemic in 1881. His mother first worked for the sanatorium washing and ironing linen. The young daughter was treated in the children's hospital. Since financially Goetz's mother did not have any savings and her income was small, von Hessing treated the girl for free, this he did in many cases with children of poor parents. After a while von Hessing recommended to Goetz's mother to work for herself and she accepted the advice of this good-hearted man and managed well. 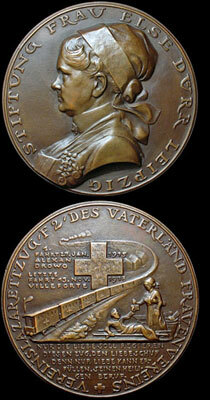 An experience Goetz had in the military hospital in Landshut was translated into a medal in 1916. As a soldier Goetz suffered from a knee ailment with ever increasing pain. The doctor in his unit did not know what was wrong, only that Goetz ran a temperature. That led to his admission to the military hospital in Landshut. The doctor in charge, court councillor Dr. Carl Uhl diagnosed immediately that Goetz suffered from an acute kidney infection which reflected in the knee joints due to a high loss of albumen. Goetz said, "That was a long time of bedrest. The kind treatment and Dr. Uhl's growing interest in my profession prompted me to ask for his permission to model for him a medal. After my recovery that sitting took place in Dr. Uhl's home in Munich. Thus was born opus 184." After Dr. Uhl's death Goetz received a commission from Dr. Uhl's sister to sculpt a bronze tablet which was attached to his tomb on the Waldfriedhof (forest cemetery). Mrs. Else Dürr, née Gontard in Leipzig was one of the most spirited supporters of Goetz's war medals. She believed in the German cause and backed it to the point of donating a complete hospital train to the government. 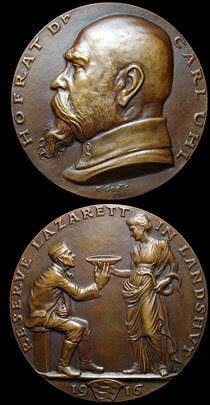 Medal, opus 276, is witness to this deed. 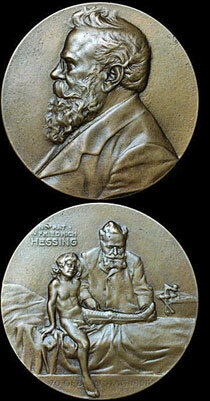 Goetz finished many medals for Mrs. Dürr including birth medals for all of her grandchildren. With her initiative she also furthered the publicizing of Karl Goetz's business. She recruited Dr. H. Bockwitz of the Museum of the German Library in Leipzig and had him write a description catalog of Goetz's World War I medals. Through her connections with the German Fleet Society (she was its president to 1933), Mrs. Dürr arranged for the insertion of the catalog into the society's magazine. Suddenly thousands of readers were exposed to Goetz's work. The end of World War I grieved Mrs. Dürr deeply. She detested the new government under Reichspresident Friedrich Ebert, yet she did give her large landholdings and buildings of the manor Mockau, which had a value of millions, to the city council of Leipzig for the construction of a future airport. "A generous lady, noble and caring," Goetz said of her in his autobiography. Mr. Heinrich Kress, a retired senior trade school teacher of Grünstadt in the Palatinate, whose wedding medal(opus 330) was executed by Goetz. Mr. Kress gives a first hand account of his and his wife's visit to Goetz's studio in Munich at the Isabella Strasse address. He says, "Goetz wanted to see our faces as they are in nature. Photographs we had sent him beforehand would not do. They were only useful to arrange the layout of the medal. He welcomed us into his studio with true Bavarian heartiness. The studio contained many lovely antiques, and, as I also am an antique collector, I immediately felt drawn to him as to a kindred soul. Our arrival had interrupted his work, but in no way was he disturbed. The stately man, a warm expression in his dark eyes, was eager to introduce us to the fine points of his art. On a slate like those used by little school children in Germany, he put a lump of plasticine, which he rounded and leveled on the surface.Then he began his work, using intermittently various wooden gravers.He created the outlines and the layout, designed the silhouettes and representations. With pointed, flat, or very fine curved tools, wetting them with his lips from time to time, he finished the last details in the plasticine. Later he made a plaster cast of this creation, bringing it to the utmost perfection. Finally he came to the bronze cast. He brought into play his imagination arranging and executing his materials as his sense of form and color inspired him. Here was a true artist atwork. His creation was graceful in composition and pleasing in design, a permanent memorial for our wedding. One cannot help but be astounded by the delicacy and accuracy of his work. After the first sittings, he continued his work with the help of photographs. But he did not like the retouched pictures as taken by professional photographers. He preferred the amateur photograph. His conscientiousness showed again when another set of pictures was taken of my wife and myself after the personal sitting."